The Hollywood Fault, according the the State Geological Survey map released in January 2014, runs east to west through Hollywood. It is represented on the map as a yellow gash, roughly 500 ft wide, traveling along Sunset Blvd, up to Hollywood Blvd and meandering its way along Franklin Ave all the way into Los Feliz past Vermont Ave. The fault runs along the base of the Santa Monica Mountains, which are strewn with precariously placed and seismically unsafe houses. It is unseen, lying under one hundred plus years of infrastructural development. In reference to the the newly mapped fault line, I walked the 6.9 miles of fault running through Hollywood. I mapped the walk on a GPS, creating a red line that correlates with the yellow line of the State released map. It is the color of a Stop Sign, of High Warning, Danger, Blood, and the Red Carpet. It is a symbol of an arterial fault ready to rupture. It stands for impending ruin, destruction and demise. It represents the celebration and solidarity of all those who choose to call California home; for everybody that lives in quake land, staying for the love of place regardless of the unknown time that the fault will finally slip. 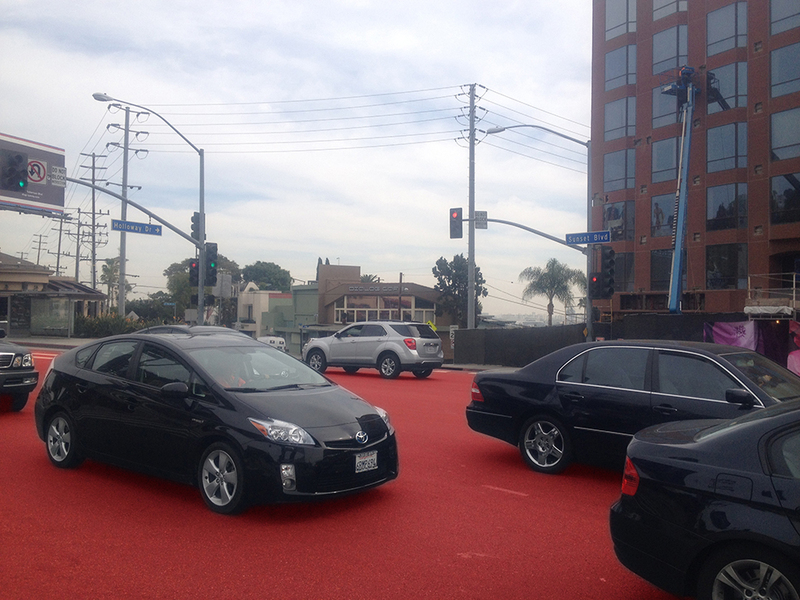 I propose to the city of Los Angeles that the entire road be painted a bright, Fire Lane Curb Red. All white and yellow road lines would remain in their normal states. The Red Road would represent the fault as an actual, physical GPS line, one that could be seen from space. A tourist attraction to be driven on and walked along by residents and visitors alike, acting as a reminder of place and as a warning for the future. The Red Road running west to east through Hollywood would begin at Sunset Blvd and Halloway Drive, turn north onto Laurel Canyon, turn east onto Hollywood Blvd, north onto Sierra Bonita Ave, and east onto Franklin Ave, terminating at Vermont Ave. When the fault wavers from the road, moving under properties, there will be a mandatory application of red for developments, housing, businesses and land, marking the trajectory of the fault. 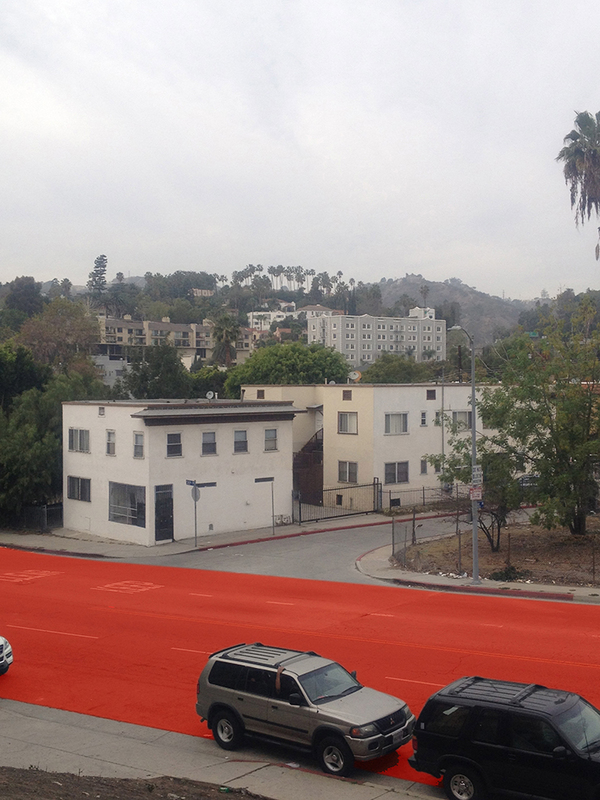 The application of red is left up to the property owner’s discretion, but is to be a highly visible marker. 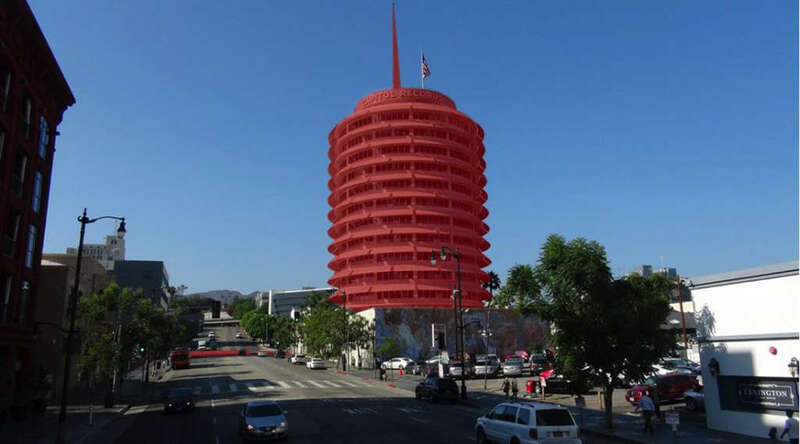 Options include painting buildings red, wrapping them with red fabric, tinting windows red, painting doors red, planting red vegetation in the landscape. The red used is to be consistent with the color of the road. The visual display of the fault is a service. The potential to map the vast network of hidden faults underneath California in manners unique to the locations of each fault would provide Californians and the state’s visitors with a visual understanding of the land’s unique geographical location, geologic formation and constant movement. The Proposal for the Hollywood Fault sets a precedent for scale and forces an engaging concept of deep geologic time and human vulnerability in the face of natural, physical processes.